Griffin Tunebuds review | What Hi-Fi? 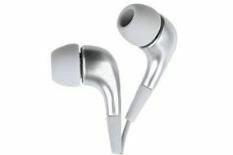 It's testament to how poor the iPod's bundled earphones are, that even these £8 Griffins are a significant improvement. You get a pair of fairly solid-feeling earphones, complete with a zip-up case and three pairs of silicone tips. Sound-wise they boast a big presentation with lots of deep bass. In fact, the low end is somewhat overbearing and fat, while treble sounds a bit sharp when pushed. However, vocals are clear, and delivery is reasonably detailed and direct.